Celtic manager Brendan Rodgers will seek to strengthen his striking options in the January transfer window. 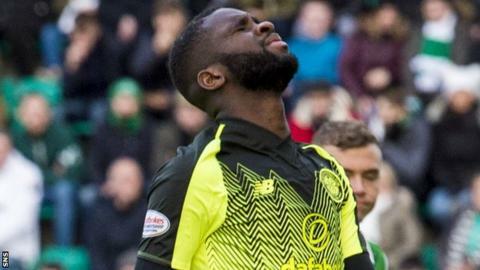 With Leigh Griffiths currently not playing, Odsonne Edouard was the only recognised front man available for Sunday’s defeat to Hibernian. Moussa Dembele was sold for a record £20m fee in August. “I think it is unfair on Odsonne, he’s had to play in so many games,” said Rodgers following the 2-0 loss at Easter Road. “As a 20-year-old I would have loved to have taken him out but, because of necessity, he has had to play. “It is unfortunate for him he hasn’t had the support around him to absorb that but it is certainly something we need to look at in January. They’ve only got one striker and he’s not performing, how are they going to solve it? You’re putting players out of position. Odsonne Edouard’s been in and out of form at times this season. You can’t keep playing him if he’s not playing well. That becomes a problem. Brendan Rodgers will be hoping he’ll get through the next few games getting results and then going into January trying to get that striker or strikers in. Odsonne Edouard’s still a young player. He’s played a lot of football, he’s having to play a lot of football. He was just off it against Hibs. You need to have the option to be able to take him out of the team. That game or two or three out of the team could just bring him on, freshen him back up and get him back to his best but at the moment that doesn’t seem like it’s an option.